Mark is not only an engineer by profession, he is an engineer deep down in his soul. Sometimes this can cause friction as I am more of the fly-by-the-seat-of-your-pants MacGyver type. Mark is more of the Type A, precision- is- mandatory-and-necessary type. I have to say that Mark's meiticulous nature is a huge boon when you are planning on living on a vessel at the mercy of the sea. Yesterday, he began doing a complete inventory and inspection of the fore cabin. 3 hours later, we have a very thorough mapping of all the wiring, plumbing, storage and construction. 3 hours for the fore cabin alone. No, I did not accompany him as he works best alone. Knowing this is true is one reason we have such a happy marriage. The wiring in the front cabin could be a bit tidier.It's not awful or in bad shape, but tidying them up will give us more storage space and on a boat, every inch counts! The ac compressor low temperature tubing in the fore cabin needs to be insulated to prevent condensation drip from mildewing the bunk. The electric windlass needs to have a dedicated battery closer to the windlass as the power is too far away, resulting in power loss. The fore water intake line is useless and not plumbed to the water tank- we can plumb it or just not use it. At this point, we are a bit undecided. The fore head is still a waste of space to us and will be used for extra storage. (still don't know why people think 2 heads on a boat is necessary). The reading lights will be upgraded to energy efficient LED lighting. This is just the beginning. Next week, Mark will move on to the saloon, followed by the galley and nav desk, followed by the aft head and cabin. Then it's on to the engine room! Then the cockpit and rigging followed at last by our anchoring system. I have absolute confidence that in time, we will have the most perfect Nassau ever. I am rather proud of Mark's efforts, sometimes his need for precision drives me nuts but the end result is always worth it. Me, I just want to look at interior upholestry choices, lighting options and the new countertop materials for the galley. Every once in a blue moon, I'm a total girly girl. At least I know not to pack my Jimmy Choos ! Having learned more about yacht design, construction and safety than I ever wanted to, I quickly figured out a cardinal truth of purchasing a cruising yacht- there is no one perfect boat. One of the other truths I learned is that taste is subjective. After amiably going along with Mark in pursuit of a boat that I thought was too big, too poorly planned out, lacking in storage and just hideous on the interior simply because Mark thought the boat had "proper yacht lines", I felt that it was my turn to pick the next likely candidate. When Mark's "proper yacht" failed the survey in spectacular fashion (proving that Engineers can be swayed away from reason by the heart just like everyone else) I put forward my dark horse favorite- The Island Packet 350. I heard all of the naysayers- who were all sailing MEN by the way- they are too slow, they are fat, they're known as Island Piglets, they are ugly boats, they are not manly, blah, blah and yet, I loved this little can do boat and still do. Mark pointed out that she was slow as molasses and couldn't point into the wind for love or money. I pointed out that when we went out for a sea trial on her, the winds were blowing, the rain was coming down, the seas were choppy, rough and building all the time and yet, the little Piglet just wallowed around happily in the rough while maintaining her course. This was a point in her favor as I think being comfortable at sea in a storm is of huge benefit. Mark couldn't complain about the interior. There was more usable space in this little 35 foot boat than in the 44 foot boat we had just surveyed. More than adequate for a family of 3 to be very, very comfortable for a very long time. I think this explains why I loved her lines so much. I didn't find her ugly- I found her whimsical and sweet. I didn't see her as chubby and slow- I saw her as steady and sure footed. 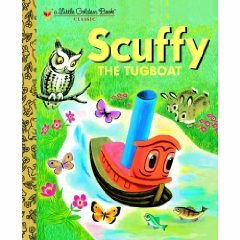 She reminded me of Scuffy the Tugboat, which was a favorite book of mine when I was about 3 years old. Ah nostalgia. In the end, Mark was willing to purchase her because she was indeed "fit for purpose" but I just couldn't buy a boat that Mark didn't love. Any boat would require a huge commitment of time and resources and it just didn't feel good to ask Mark to make a commitment of this magnitude to a boat he didn't absolutely love. For all you IP owners who take the ribbing from people who just don't get it, feel free to turn to me for a sympathetic ear. I get these boats, I really do. And to you- the little almost ours IP that I would have named Muc Dubh and loved for many years- I hope you find a family to take you on adventures out in the wide, wild world. I really do. Blisters. Ugh. We have known since the survey on May 5 that the S/V soon to be officially named Ceol Mor has cosmetic blistering on her hull. A lot of blisters...a whole mess of the boat pox. I could go into the long and lengthy explaination of the different types of boat blisters, the theory on why they happen and the various techniques used to correct them but its much easier to just tell you to GOOGLE IT! The conundrum we face right now is complex and we are undecided as the best course of action to take just now. Since these seem to be only cosmetic in nature, there isn't the huge push to get the boat out of the water and dried that there would be if these were blisters that penetrated the gelcoat. So. Do we sail her a bit for the next month or so, getting to know her and what her other needs might be before putting her in the yard for 2-3 months for repair or do we put her in the yard immediately and put off sailing until September? My gut instinct is to schedule a haul out and lay up for her in July, sail her a bit for the next month so that any additional repairs or equipment installations can be handled at the same time as Ceol Mor's bottom job. Decisions, decisions... we could speed up the process by having her hauled now, giving her hull a bit more time to dry out before starting the blister repair. It IS rather humid just now and that will slow down the drying process. July and August should be quite a bit drier. I hate these kind of decisions. I need a crystal ball to see what the weather will be doing in August. Anyone have one handy? 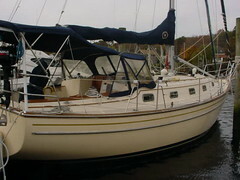 I've been hesitant to start this blog until we had definitely found and purchased a boat. Since we have in fact, purchased a boat - all but the signing of titles- I feel I can safely give you an update on what we have been doing in order to get ready for the big adventure. You know those video montages where the photos of a persons entire life is set on fast forward? That's a bit how the last 4 months have felt. Here is what we've accomplished this far: learn about sailboat construction and design, begin combing listings (over 1200) for a list of suitable candidates, educate ourselves about pointing ability, weather helm, sea kindliness, learn to asses boat safety and condition by eye, learn all about various sail rigs and the pros and cons of each, identify our list of must haves, plan a route for our travels, investigated sailing conditions for said route, shopped for boats for hours online, shopped for boats for days in person, looked long and hard for a great marine surveyor, put in offers on four other boats, have one boat hauled out and surveyed, sea trialed two different boats,dealt with brokers who were good, brokers who were bad and brokers who were just plain greedy, complete a weekend ASA course, complete additional ASA training, found a boat that works, made an offer, have boat hauled and surveyed, adjusted offer, visit the boat 4 times to inspect the handy work of mechanics who were doing repairs, sea trialed the winning boat, sea trialed the winning boat again, learned all there was to know about boat insurance, purchase insurance, learn more about hull blisters and the various repair techniques than I ever wanted to know, investigate Coast Guard Vessel documentation regs, find a documentation company to handle the Coast Guard regs because they are so meticulous and involved,find a marina, find a slip at the marina that will fit our big gal, look in vain for Mark's ancient RYA certifications in order to lower the insurance rate , give up on this,develop a list of must have safety items, develop a list of equipment, comparasion shop 50 different chandlers for each and every item because DAMN this gets expensive, get quotes on replacing the standing rigging, get quotes on blister repair and bottom painting, consider the merits of different manufacturers paint systems, schedule more sailing lessons... and there's more but I just can't stand to waste the bandwidth. Suffice it to say, we've been busy. Once Ceol Mor is ours free and clear ( THIS MONDAY!) we get to move on to the far more exciting task of boat repair and finding a competent yard that isn't run by a pirate. I'm hoping that we can at least take off for a week trip down the coast to Corpus Christi before we have to have her hauled out to have her bottom taken care of and her standing rigging replaced. I knew a few things about Mark by our second date. Perhaps I wasn't quite aware of all his personality quirks, his likes or dislikes but I did find out one very important bit of information- Mark wanted to sail. Not just a little day sail around the bay but a transoceanic trip from New Zealand to French Polynesia. This was his life's ambition and the driving force behind his desire to retire by age 50. I being a bit of free spirited, try anything kind of a gal, took him at his word. If this relationship was to be mutually satisfying, a bit of adventure was going to be required. I was "down with that", so we filed it back in the "someday" file. Christmas and birthday presents were easy for him- cruising guides for French Polynesia, charts for Fiji, sailing watches that not only told the time, but functioned as a compass, barometer, thermometer and split timer. It was fun to buy him these things with an eye to "someday'. I never thought of it as a frivolous, offhand, pie in the sky dream, it was something that was important to him and it was becoming increasingly important to me as well. Fast forward almost 4 years and we are newlyweds looking forward to our life together. Sailing was still in the far off plans but it was easy to be distracted by work, a newly blended family, home owner duties, friends, kids, inlaws and outlaws etc. While starting our married life and making plans to move back to the UK, life threw us a curve ball. I won't go into details for many reasons but suffice it to say that sometimes through no one's fault, dreams don't come true. It was while sitting around in a deep funk that I picked myself up, wiped away my tears and made a new motto for myself " If your dreams are dashed and don't come true, dream a different dream". Right. I made the decision that there were no guarantees in life and that if we spent all of our time thinking about "someday" we would find ourselves at the end of our life having done nothing of importance. I suggested to Mark that we should delay our departure to the UK and take advantage of our current proximity to the Carribean. We should spend a year with the youngest kid on a boat, cruising the Caribbean and either South America or the East coast of the US. After realizing that I was serious, Mark signed on and we got down to the business of dreaming a new dream. That was 4 months ago. Most people take a few years to formulate a plan, purchase and outfit a boat. We would have 9 months before our tentative departure date of November, 2009. If 9 months is enough time to grow a human, surely it will be enough time to hone our sailing skills ( Mark is a bit rusty, I aspire to being a greenhorn), learn all that we can about navigation, safety, route planning, provisioning, financial planning, etc. etc.? It IS daunting and a huge challenge but what in life that is worthwhile isn't?